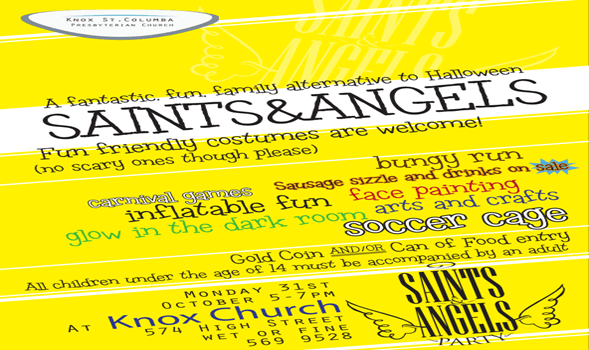 Saints and Angels Party (a Halloween alternative). Dress up in your favourite costume and join us for an evening packed with fun! There will be a giant slide, bungee run, bouncy castles, football cage, face painting and a variety of carnival games. Everyone receives free popcorn and candy floss! Sausages and drinks are available for $1. No scary costumes, please. Entry is by way of a gold coin donation and/or can of food (will be donated to the food bank).